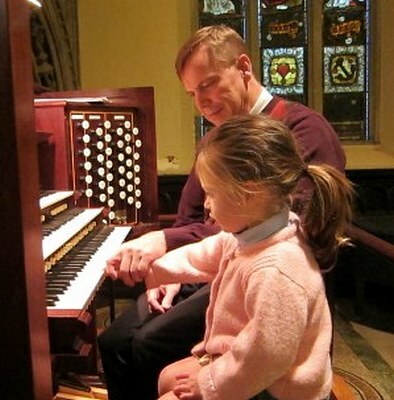 Paul Richard Olson has completed twenty years’ service as Organist and Choirmaster at Grace Church, as well as Music Specialist at Grace Church School (he is shown in the photo giving an introductory lesson on the church’s Austin Organ). Today, there was a celebratory brunch in the church’s Guild Hall to mark the occasion. As a special honor to Paul, the hymnist Jacque B. Jones, a member of Plymouth Church, wrote the lyrics to a new hymn, “As Starlight Warms to Daybreak,” which she set to a Swedish melody in recognition of Paul’s Scandinavian heritage. There’s a video of the assembled multitude singing the hymn after the jump. Piano accompaniment was provided by Craig Whitney, retired New York Times editor and Grace Church parishioner, as well as author of All the Stops: the Glorious Pipe Organ and its American Masters, a must read for fans of the King of Instruments. Photo: Grace Church; video by Martso. I'm a Mets fan. Consequently, I'm imbued by what Miguel de Unamuno calls "the tragic sense of life".